A colorful and veggie packed rice and black bean casserole. Filled with black beans, spinach, tomatoes, corn and zucchini. I love a recipe where you can use the leftovers in different ways. This rice and black bean casserole is one of those recipes. Serve it for dinner and then, the next day, wrap it up in a burrito with some avocado and lettuce. Or use it as the filling for a quesadilla by adding a bit more cheese (yeah cheese!) and some salsa. Or chop it up and toss it with some lettuce and dressing as a burrito bowl. 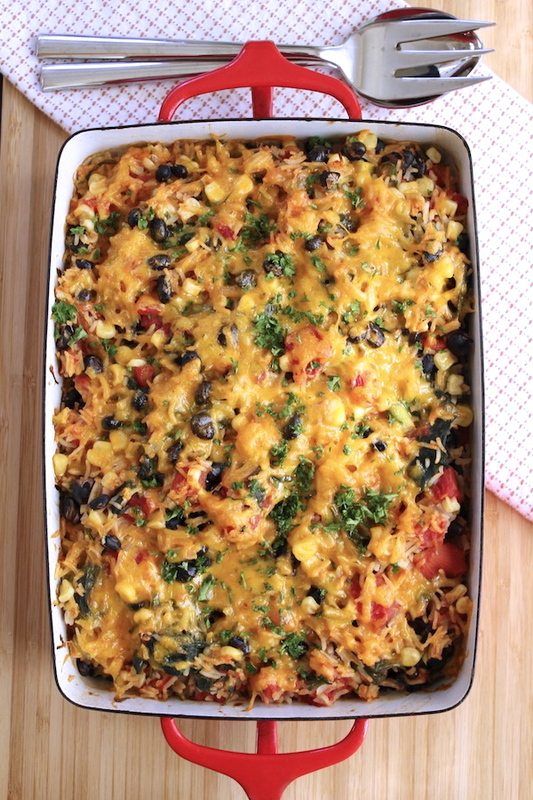 This is a colorful casserole that is packed with veggies – you’ve got black beans, spinach, tomatoes, corn, scallions and zucchini. You can add anything you like. This is a “use it up” casserole – have some extra veggies on hand that you don’t know what to do with then just chop them up and add them in. This casserole is also an excellent way to use up any leftover rice you may have on hand. I used white basmati rice. You can substitute whatever kind of rice you like. If you don’t like rice then try adding cooked quinoa instead. Whatever rice you use, add a bouillon cube to the rice as it cooks. This is a forgiving casserole – if you want more beans then use less rice and add more beans. If you like your casserole really spicy then use more salsa and less tomato. I used cheddar since it was what I had on hand. I think a combination of cheeses would be a great addition – maybe cheddar and monterey jack or pepper jack if you like it spicy. On Wedneday I’ll be posting a great quinoa and lentil salad and on Thursday a super yummy wrap. So check back then or use the sign up feature and I’ll email the recipes to you directly. A colorful and veggie packed rice and black bean casserole. If you have 2 cups of cooked rice left over from another meal, then toss cooked rice with lime juice. If you need to cook the rice before hand, cook 1 cup of rice per package directions – add bouillon cube to water. When done, let rice sit covered for 10 minutes. After rice has cooled, fluff and toss with lime juice. Add cooked rice to a large bowl. You’ll be adding all the ingredients in to this bowl. Drain black beans and add to bowl. Saute spinach and minced garlic in a little oil until slightly wilted. Add to bowl. Add corn and scallions to saute pan and cook over medium heat for 3 minutes. Add corn and scallions to bowl. Grate zucchini and add to bowl. Add can of diced tomatoes (and juice in the can) to the bowl. Add 1 cup of grated cheese to the bowl. Mix everything together in the bowl. Lightly grease a 10 x 8 casserole. Pour rice and black bean mixture in to casserole pan. Top mixture with remaining 1 cup of grated cheese. Remove and sprinkle minced parsley over the top as a garnish. Your recipe calls for 2 cups cooked rice, yet you give instructions to cook the rice. Do you mean uncooked rice? If it is 2 cups cooked rice, how much uncooked rice would I start with? Hi Gigi – thanks so much for pointing that out. I have updated the recipe. If you don’t have 2 cups of cooked rice left over from another meal, then you will cook one cup of rice (which doubles in size yielding 2 cups of cooked rice). Hope you enjoy the recipe. I made this with peppercorn cheese and wild rice – it was so delicious!! I threw everything in the bowl without sautéing anything first (I did thaw the corn first) and it turned out great. I couldn’t stop eating this dish! Thanks for the great recipe! Thanks for letting me know, Elena! This looks good…I am basically vegetarian..eat fish and eggs. I don’t eat healthy though because I hate to cook. This looks easy enough. I would like to subscribe to get easy veggie recipes. Thanks! Hi Janet: I have added you to the email list – I think you will enjoy the recipes and hopefully they will inspire you! Bags of spinach come in different sizes…what size did you use? Also, I was wondering if you squeeze any of the liquid out of the grated zucchini before adding it? Perhaps the rice absorbs all that liquid? Thanks! Hi Laura: A 6 oz bag of baby spinach is what I used. I didn’t squeeze out any water from the zucchini – I just grated it and then added it to the bowl. Hope you enjoy it! I saw this recipe on Pinterest amd I loved it my husband who just became a vegan loved it as well. Thank youvso much. Thanks so much for letting me know, Nette – I’m so glad you both enjoyed it! My daughter-in-law made this for dinner the other night and it was absolutely wonderful. She even sent some home with me. She printed out the recipe for me and I am definately putting it on my “make soon” list. Thanks, Paula – so glad you and your family enjoyed it! Thanks for letting me know. Do you think this would freeze well? I’m looking for things to either cook or prepare in advance. Thanks! Hi Dayna – I haven’t tried freezing this dish but I think it should work. Please let me know if it works out okay. This is awesome! Thank you!!! Such a good base recipe. I am not a good cook at all, I don’t like to cook, it doesn’t come naturally to me, so improvising is hard. Thanks to your encouragement, I tried, and with delicious results. I cooked the brown rice in bouillon per directed. Our abundance of brown rice was the inspiration for me to go online and find this recipe, so I was happy that the recipe called for two cups. Had lime, but forgot the lime in step 1, so added it at the end. Had a can of pinto beans, so substituted that for the black beans. Skipped the spinach and corn, because we are out. Didn’t have fresh garlic, substituted with dry. Substituted onions for scallions and carrots for zucchini, because that’s what we had. Omitted the diced tomatoes because we didn’t have any, so halved the cooking time. Added spices per Cassandra. I also like my food less spicy, however, my husband likes the spicy, so added a 1/2 teaspoon of chili powder (a good compromise) It is DELICIOUS! Thank you again!!! YAY – Jax! So glad it was a big success – and I love that you changed it up to work with what you had. Cooking should be fun – not a chore – so I’m really glad that everything worked for you and that you enjoyed it so much! I think one of the reasons this recipe has been so popular is that you can change it to work with whatever you like or have on hand. Thanks so much for taking the time to let me know – I really appreciate the feedback! I made this today. I must say you have to add quite a bit more seasoning to this dish than what you’ve described. Mine turned out great, but I had to add quite a bit of spices to it to accomplish that. Cumin, chili seasoning, crushed red pepper, etc. I may make it again, but it needs a lot more than 1/2 jar of salsa and garlic as seasoning. Hi Cassandra – I don’t like things too spicy so salsa and garlic was all the seasoning I needed but glad you changed up the spices to fit your taste! Thanks for letting me know. Hi Jeremy: I’ve added you to the email list! Thanks – hope you enjoy the recipes. This sounds and looks delicious! Do you think there would be any problem with prepping everything up through step 14, then refrigerating and baking it off later? Hi Stephanie – I haven’t prepped and refrigerated the dish before baking, but I think it should be fine. Or, if you’re planning on refrigerating it overnight, you might just want to hold off adding the salsa and diced tomatoes – prep everything else – then add the salsa and diced tomatoes just before putting it in the casserole – then top with the remaining cheese – and bake. Please let me know how it works out for you! Is there any way you could get your recipes to be accepted by PepperPlate. When ever I try to import a recipe from your site, it tells me the site is not supported and to enter a url from a supported site. So, I usually end up doing and lot of copying and pasting trying to get everything into my PepperPlate recipe file so I can have the recipe on my tablet and with me for shopping and for cooking. Hi MG – I’ve never heard of PepperPlate before but will look into it to see what I can do. Thanks so much for letting me know – and glad you like the recipes :). Have a good night! Hi MG – I looked into this and PepperPlate only has the big food and magazine sites as supported sites. No love for us little guys! Sorry I couldn’t be more helpful. Have you tried adding onions instead of scallions and taking out the zuchinni? You’re basically substituting 2 smaller flavors for one larger one. It’s pretty good. That’s what makes this casserole so easy – you can swap in or out whatever you like. I’ll have to try onions next time, maybe some green pepper too! No surprises here, so easy to make,enough for a hungry crowd! Have Rob and Bonnie over to help you finish it off! This looks fantastic. I definitely need some more vegetarian meals. Anything to get my husband to eat more vegetables! I think he’d love this. Thanks, Jessica. I think your husband will really like it – I think the cheese will win him over :). Have a good one! I came to you by way of thekitchn.com and a link to this recipe, which looks great. I’m impressed with your blog! Thanks! Thanks for stopping by and leaving a compliment, Clint. Have a great day!